Your living room carpet has seen better days... the carpet in your son's bedroom has worn spots... you just finished a house addition and need new flooring... warm underfoot, sound insulating and economical - carpet is a great solution for any of these situations and more! When you're ready to buy new carpet, take a second to consider these four tips from Indianapolis carpet store Kermans before you go shopping. Choosing the best carpet for your needs means knowing the right combination of characteristics, aesthetics, performance and budget that best serves your lifestyle. A good carpet store will be staffed with flooring experts that can help you determine the best solution for your space. Here are a few of their top tips for buying carpet. No matter what style carpet you choose, the more fibers per yard the longer it will last. Great pile density and more tightly twisted yards result in better durability. It's worth asking about your carpet's pile density before choosing your carpet. Certainly your personal preference and design style will help dictate the type of carpet you choose but don't forget to consider how the room will be used. The carpet that works perfectly in your dining room may not be the best option for your family room. Carpet styles should be matched to your anticipated traffic patterns; room use; style of furniture; wear and tear; and of course color and design. You'll want to take all of these factors into consideration when you pick carpet for your home. Learn more about the most common types of carpet available. Carpet covers a large area of any room so color can carry a big impact. Once carpet is installed in a new home, it will often look lighter than the sample you saw in the store. As to take samples home to see how the color looks in your room – in both day/natural light and night lighting. Consider the size of the room when thinking about color too. Light carpet colors will make the room seem more open and darker carpet colors will make the room feel cozier. One of the most important considerations in choosing the right carpet is one you can't even see: carpet padding. Carpet padding is the material that lies between the carpet and your floor and it makes a big difference. Many people don't realize that it's the padding, not the carpet itself, that determines how a carpet feels beneath your feet. Some carpet padding even adds a moisture barrier that is a great help in homes with pets. You're going to be living with your carpet for years to come. Make sure you select a carpet that enhances your space and stands up to your lifestyle by keeping in mind pile density, style, color and padding. 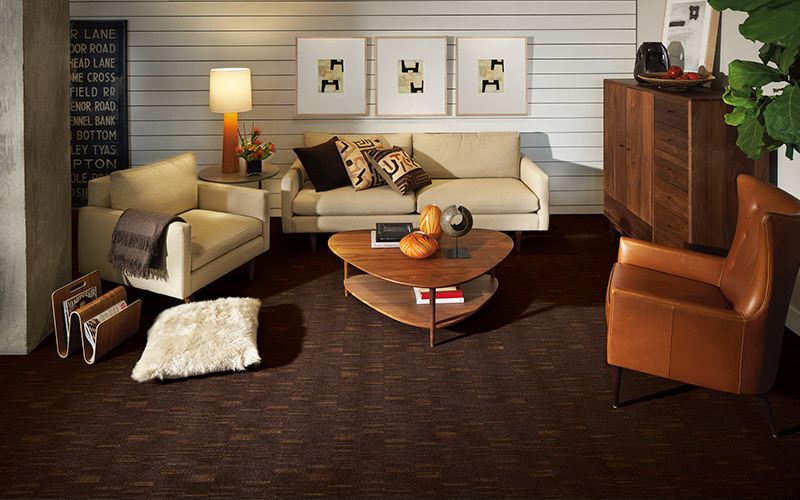 Learn more tips for buying carpet in our free Carpet Buyer's Guide.